October 30th 2011 saw the second of 2011's two Prisoner Locations tours take place. 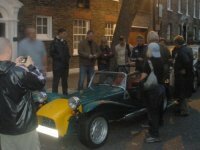 Organised and led by the inimitable Dave lally, who has organised free Prisoner tours for over 25 years (unlike other Prisoner tours which require expensive memberships to attend (and include fewer locations)), attendees included a "Prisoner" Caterham 7. The day began with a smaller, yet still well attended, tour of Danger Man and Avengers locations before the full afternoon "Prisoner" tour. For a photo report of this event click HERE. The previous evening, countless "Prisoner" fans (as well as crew from the series) attended Earl Cameron's tribute from the BFI. Earl was in great form and at 94 astounded attendees with his memory as clips from his appearances, including "Danger Man", were shown.